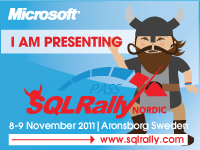 Why I’m Excited to be Attending SQLPass SQLRally Nordic 2011! 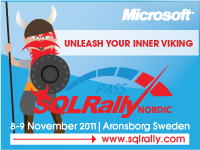 Delighted to announce that I’m be attending and presenting at the Professional SQL Server SQLRally Nordic 2011! The event will be taking place on 8th – 9th November, at the Aronsborg Conference Centre just outside Stockholm, in Sweden. The FaceBook page can be found here. To register for the event, click here and we’ll see you there! The SQLRally Nordic event looks set to be an outstanding event, with speakers from SQLCat attending, such as Mark Souza, Thomas Kejser and Alexei Khalyako. Other highly respected speakers will be attending, including Itzik Ben-Gan, Kevin Kline, Chris Webb, and others that are too many to list here! If you’d like to read more, then please do head over and check out the speakers list. There are three main ‘streams’ which are Business Intelligence, Development and DBA. We particularly liked the list of sessions, which are very well-balanced and cover a breadth of topics, as well as offering a depth in expertise. We’re glad we’re speaking and we hope to be able to listen to the presentations too. In the sphere of Business Intelligence, a range of topics are covered, including Programming Patterns with BISM Tabular by Alberto Ferrari and an Introduction to BISM by Marco Russo. There is also a session by Simon Lidberg entitled Planning and forecasting with SQL Server, Excel 2010 and SharePoint 2010 which sounds intriguing! There is also a long list of sponsors, including HP as presenting sponsor, SolidQ, and SQLBits favourites Fusion-IO, and Quest. We think it will be an amazing two days and there are sure to be plenty of opportunities to mix with other SQL Server community members when you’re out of sessions! We’re thrilled that Jen’s speaking and honoured that she’s presenting a community session at this event. If you’re going to SQLRally Nordic, please get in touch with us at @ThinkCopperBlue and @JenStirrup on Twitter, and we’ll look forward to seeing you there! Here, we will look at an example of PowerPivot user feedback that is improved in Denali from SQL Server 2008 R2. User feedback is a vital part of any software. In particular, this is especially important in the case of error handling, regardless of whether it is a pre-emptive measure in preventing error handling, or a post-error warning after the error has taken place. Schneiderman has specified a series of 8 ‘Golden Rules’ for interface. Generally, I think that the ‘golden rules’ apply fairly well to graphs and charts, and I’m interested to explore this idea – hence the current series of blogs! Schneiderman’s Fourth Golden Rule is to offer a Design Dialogue to give the user a sense of closure. Thus, the activity has a beginning, middle and an end. The information at the end of the activity provides a sense of closure to the user; it means that the path to the next step is clear for the user, who can move on from anticipating any errors or issues with the activity in question. There is one improvement in PowerPivot Denali which is illustrative of this point. In the current 2008 R2 release of PowerPivot, the ‘New Measure’ box provides us with an opportunity to check that the Measure formula is correct. Here is an example below. Can you spot what the issue might be? Although this seems like a little thing, it is extremely effective. If you’ve ever held your breath to see if your PowerPivot formula has worked, and felt the sense of relief of realising that the red ball means ‘Success’ in 2008 R2, then you’ll know what I mean! I am hoping that the tick will cater for colour-blind people as feedback if the green colour is an issue, and I look forward to your comments on this issue. Little things make me happy! Excel Slicers are incredibly useful for filtering data in Pivot Tables. I like them since they are so very visual; it is easy for users to see the state of the columns that they are filtering. If you’ve ever been given a large spreadsheet with many, many columns, and tried to work out which field is being filtered – then you’ll know what I mean! By default, if you filter using the Excel slicers, then you may find that the slicers move around when you filter. If you’d like to make sure that the slicers stay in one location, then here is the settings to allow you to do just that. Why is it important to ‘lock’ the Excel slicers into place? Ben Schneiderman discusses 8 ‘Golden Rules’ of interface design, and these principles are very useful for chart design too. The main rules that apply here is the ‘Strive for Consistency’ Rule: actions should be consistent and similar actions should be required to achieve similar objectives. However, if the Excel slicers are moving up and down on the page, this can mean that the actions are not consistent because you may have to move the slicers around first so you can see them clearly, and then select the filter that you need. In order to maximise consistency, it is useful to ‘lock’ the Excel slicers into place so that there is no additional step of separation between the user and the activity that they would like to undertake. 1. Right-click on the Slicer, and choose ‘Size and Properties’ at the bottom of the pop-up menu. 2. A dialog box will appear, called ‘Size and Properties’. 3. Click on ‘Properties’ on the left hand side. That’s it! The Excel slicers will be anchored to the location that you use to set them. This will help the user, who could be frustrated by the additional step of separation between themselves and the filtering activity that they would like to undertake. To summarise, Excel slicers are a great idea for users, and their flexibility can be maximised in order to ensure that good design principles are maintained for users.